There is so much to learn about green tea, and now it is time to focus on matcha. Matcha is a powdered green tea traditionally used in the Japanese tea ceremony. Matcha is made from leaves grown only in Japan. It may actually be even healthier than brewing loose leaves, because you are drinking the actual ground up tea leaves! I imagine that means there is more caffiene, too. There are many grades of matcha, from food grade up to the ceremonial grades. There are two main differences in matcha, 'thick' and 'thin'. Thin matcha is called usucha. 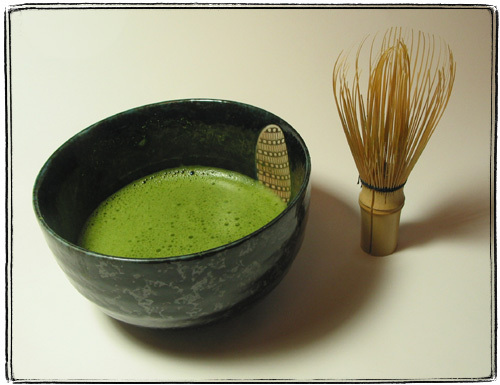 Thin matcha is more common than the thick version, and actually has a stronger, astringent flavor. Thick matcha, koicha, is grown from tea plants that are at least thirty five years old! It has a milder taste, so more of the powder is used, giving it a thicker consistency. Koicha is usually more expensive. My matcha research has also led me to lots of beautiful chawan (chawans? ), on etsy.com. I cannot choose one! They are all so lovely!! Tea and shopping. What could be better!! Once I have the proper tools, I will share my matcha experience. Matcha tea is so elegant, peculiar and healthy! I totally understand what you say. It's not just the tea, it is also the proper tools it involves...It's a world itself. Amazing! Have you tried it yet? Which Matcha bowl did you buy? Let me suggest you something. Once you enter the Matcha world, you can cook many things with it, so why not try a Green tea Ice Cream recipe? You can have it all year! It's pretty good actually. If you have the time to do it, tell me if you liked it.